Jeff Schultz and Eric Fehr, who play for the NHL’s Washington Capitals, left frigid D.C. during the All-Star Break to come to sunny Ponte Vedra Beach, Fla., and play THE PLAYERS Stadium Course at TPC Sawgrass. PGATOUR.COM: What did you think about the 17th hole? I hear you had a 10-foot birdie putt there. SCHULTZ: It wasn’t as hard as I thought. 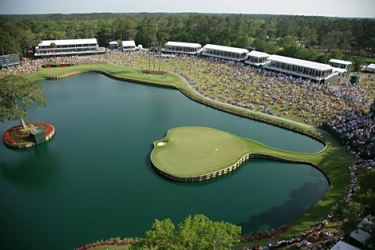 But I guess if you’ve got a couple of stroke lead coming down the last day and everybody watching you, I can see why they call it one of the hardest holes in golf. It’s a tough green to read. I was able to par it. It was the highlight of my day. PGATOUR.COM: What similarities do you see between golf and hockey? FEHR: I think it’s kind of the swing—a slap shot and a golf shot. To me I putt like I’m playing hockey. I put my hand on the bottom of the putter.